McIntosh's signature faceplate is iconic for fans of vintage sound and music history — like many of us here at Crutchfield. If you're as enamored with those retro-cool knobs and beautiful, glowing blue meters as we are, check out the McIntosh MCLK12 mantle clock. This wall-mountable timepiece sports the company's classic glass-front design. Now you can display McIntosh's legendary look in any room or office. Hours and minutes stand in for the usual McIntosh meter readings. When the hands get to the end of their dial, they "fly back" with a satisfying snap. The clock's long-life backup battery keeps it up and running during power outages. If I were more inclined to puns, I'd say that this striking collector's item proves that McIntosh can really stand the test of time. hour and minute hands displayed as "meter readings"
McIntosh Metered Clock: The McIntosh MCLK12 mantle clock is a celebration of time while being a tribute to classic McIntosh design. The perfect "audio fashion accessory" for the McIntosh enthusiast, the MCLK12 features McIntosh's famous glass-front-panel design and enlists iconic McIntosh Blue Meters to read time, with one meter scale calibrated in hours, the other in minutes. Only the finest precision parts are used throughout. The MCLK12 is the ultimate fun way to monitor the passing of time. Blue Watt Meters: Constructed with the signature McIntosh blue watt meters, the MCLK12 demonstrates the same easy to read visual interface. The large Minutes and Hour Meters on the MCLK12 display the current time and are illuminated with extra long life Light Emitting Diodes (LEDs). The blue meter lighting may be switched on or off from the front-panel, or by other McIntosh components, depending on the viewing conditions. The hour and minute hands cover a twelve and sixty minute arc respectively on the MCLK12 along with Power Output Meters on compatible McIntosh Power Amplifiers. Both hands "fly-back" in a retrograde fashion when they reach the end of their scale. Precision Oscillator: The McIntosh MCLK12 Metered Clock's circuitry utilizes a precision temperature compensated quartz crystal oscillator for accurate time keeping, even with room temperature fluctuations. 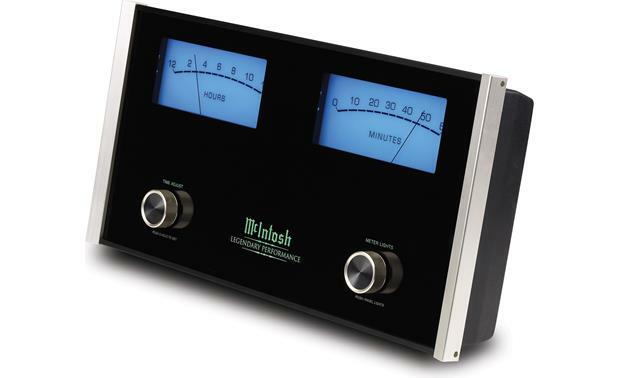 Mounting Options: The McIntosh MCLK12 Metered Clock may be shelf mounted, placed in an equipment rack with other McIntosh components, or be mounted on a wall using the rear-panel, built-in keyhole slots. 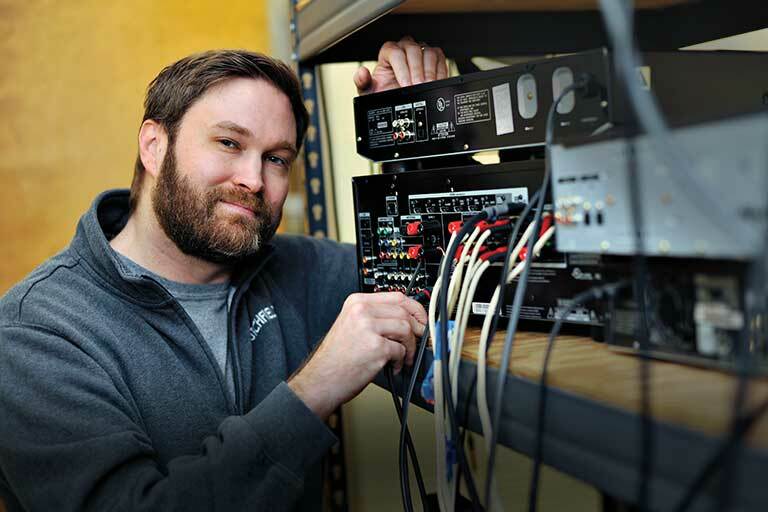 Power Control Input/Output: The Power Control Input and Output connections (3.5mm) provide convenient Turn-On/Off of front-panel illumination of the MCLK12 along with other McIntosh Components. Efficient Power Supply: Its cully regulated power supply ensures stable, accurate time keeping operation even though the power line many vary. Its efficient design allow for very low energy consumption. AC Power: The MCLK12 operates off of standard household current using its built-in power supply and detachable AC power cord. Battery Backup: A long life CR2032V 3V Lithium battery is used for backup of the crystal oscillator for accurate time keeping in the event there is an interruption of AC Power. Searches related to the McIntosh MCLK12 Mantle clock.